When it comes to buying furniture in Columbus Ohio, this should be a fun shopping experience. However, many people admit they feel it becomes more of a chore. Finding just the right selections for your home that represent who you are and also meet your taste requirements can feel like a daunting task. That is if you do not know where to go shopping for your furniture. Residents of Ohio know that when they shop at Amish Originals Furniture Co., buying furniture in Columbus, Ohio can be enjoyable once again. Shopping for the furniture and decorations for your home only becomes a chore when you have to travel to several different locations to find all the items you need. When you shop at Amish Originals Furniture Co., you will quickly come to understand how easy and enjoyable we make shopping for home furnishings. You’ll find every piece you need in just one location. If you have never shopped at Amish Originals before you may not yet realize what makes us stand out from the other choices in Ohio. So what does qualify Amish Originals Furniture Co. as the best place for buying furniture in Columbus, Ohio? Highest Quality Standards — When it comes time to invest your hard earned money into furniture for your home, you want to know you are getting the best quality available. There truly isn’t furniture out there with higher standards. It starts with the quality American hardwoods used to craft each piece. The building process itself is done by hand using time-honored techniques that have been handed down through generations of Amish families. The results are items that not only withstand the test of time but can be considered true family heirlooms. Plenty of Options — When you shop at Amish Originals, you will find a wide variety of styles and selections for every room of the home. We even carry furniture for the outdoors. From there, before your pieces are hand built, you also customize the items with the type of American hardwood and finish you want for each piece. More Categories than the Average Store — You really can find the best selections for every room in your house when you shop at Amish Originals Furniture Co. This is another way we make it much easier for shoppers to be able to find everything they need in just one location. It does not matter if you need the perfect desk for your home office, bed for your kid’s room or chair to relax in while on the porch. 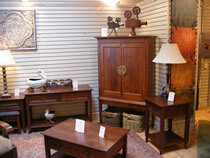 You’ll find it all and more at Amish Originals Furniture Store. Not to mention, isn’t it nice to know you are shopping local? More and more shoppers across Northern Ohio are making the pledge to shop local. We’re honored to have become part of the local community here since first opening our doors in 1992 and love to meet all our customers personally. There is no better selection or quality to be found when buying furniture in Columbus, Ohio.